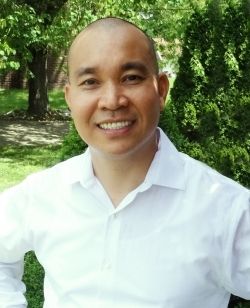 FROM: “Commitment, Positivity, and Inclusiveness: Questions and Answers with Dr. Minh Nguyen,” EKU Magazine: A Publication for Alumni and Friends of Eastern Kentucky University, Spring 2017: 13. See also: http://stories.eku.edu/people/nguyen-i-owe-virtually-everything-eku. Why do you love teaching at EKU? I owe virtually everything in my professional life to EKU. Even though I was born and raised in Vietnam, I feel very much at home here. I identify a lot with students in Appalachia. Like many of them, I was a farm boy (and) a first-generation college student. I understand our students’ struggles. I understand their dreams. Talk about what the Honors Program has meant for students during the time you’ve been involved. For many students, EKU Honors represents an accessible and financially workable option for one of the very best higher-education experiences in the region (and) provides an opportunity for a small-liberal-arts-college sort of experience in the context of a large, comprehensive public university. With the average ACT composite score of Fall 2016 incoming class topping 29 for the first time, EKU Honors is becoming a top choice for many of the very best students from around Kentucky and across the region. Tell me your approach to mentoring students. Commitment, positivity and inclusiveness. I am not averse to calling for intensive effort from others and more so from myself. My students know, however, that I care, and that I enjoy learning and making discovery with them. What is one thing you wish everyone knew about the Honors Program? The fact that EKU Honors is widely acknowledged by honors educators nationwide to be one of the very best programs of its kind in the United States. Since 1990, more than 900 EKU Honors students have made presentations at the Annual Conference of the National Collegiate Honors Council (NCHC) — a total that far surpasses that of any other honors college or honors programs in the world. We are also leaders in securing nationally competitive awards. Over the past five years, EKU Honors students have earned two Fulbright English Teaching Assistantships, three Phi Kappa Phi National Fellowships, one Humanity in Action Fellowship, one NCHC Portz Scholar Award, one Salzburg Global Citizenship Alliance Internship (the first SGCA Internship in the world), one Truman Scholarship (the only Truman ever won by a student at any Kentucky comprehensive regional university), and one Mitchell Scholarship (the only Mitchell ever won by a student at any public institution of higher learning in the Commonwealth).